Kielbasa, or Polish sausage, is a mixture of ground meat and spices secured in hog casings that is cured and smoked. The sausage's key ingredients include pork, beef, garlic and marjoram spice. 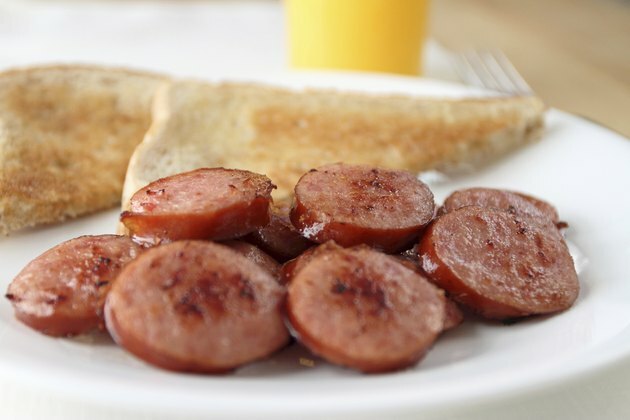 Cooking a kielbasa ring can be done in a number of ways, depending on your preference. For those with time restraints, a slow-cooker recipe may work, but even when using the oven or stove top, cooking your kielbasa should take less than an hour. Place the kielbasa into a saucepan and cover it with water. Set the pan onto a burner turned to medium heat. Allow the water to come to a boil and then reduce the heat. Cover the pan with a lid and simmer the kielbasa on the stove for 25 to 30 minutes. Drain the water and transfer the sausage to a serving dish. Spray a baking pan with a light coat of vegetable oil and place the kielbasa inside. Set it in the hot oven. Bake the sausage for 15 to 20 minutes. When the skin of the kielbasa swells and starts to split, remove the pan from the oven and serve. Pour one can of sauerkraut into a slow-cooker. Fill the sauerkraut can with water and add it to the pot as well. Lay the Polish sausage ring on top of the sauerkraut and cover the pot. Set the temperature of the slow-cooker to "Low" and slow cook the kielbasa in the sauerkraut for eight to 10 hours. For an added treat, cut the kielbasa into hot dog-sized pieces and wrap them inside raw pastry or biscuit dough. Brush the outside of the dough with melted butter and bake the sausage for 20 minutes at 400 degrees Fahrenheit.